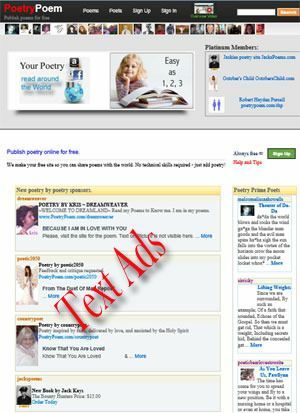 advertise/promote your Poetry Site, Book, Product, etc with Text Ads. What is a Text Ad? Ee Example of Text Ads on PoetryPoem's Homepage. Step 1. Go to your Poetry Control Panel and click on one of the advertising buttons (Promote, Promotion Manager or Advertise with us). Add Link Text (Use up to 30 characters. Example: MySite). This tells vistors where the link will take them. Destination URL or location. Example: http://poetrypoem.com/mypoems. This is where the visitor goes when they click your ad. Important step! Click the Test URL button to make sure your ad is taking your visitor to the right location. Important step! Click on Save New Ad button. 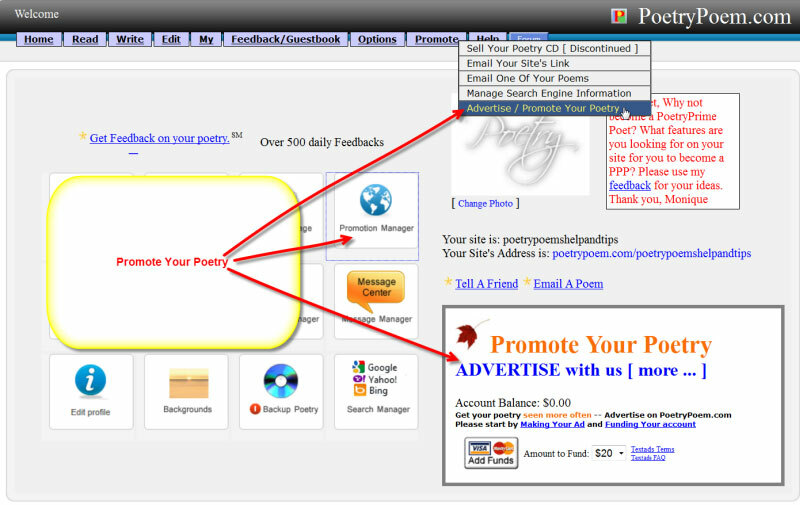 If you do not see your advertisement on PoetryPoem’s homepage, it is because of your Cost Per Click, CPC, is below the Cost Per Click, CPC, of the fellow poet’s advertisements on the homepage. Thank you to all the poets that help support PoetryPoem.com. Below is a link to frequently asked questions about Text Ads.